If you’re ever in Plains, PA, on a Sunday morning, you may be drawn to your most legitimate option for a friendly brunch with drinks: The River Grille. And since you’re here, we can assume you’re an aficionado of sandwiches, so you’ll have to pick this from the menu. 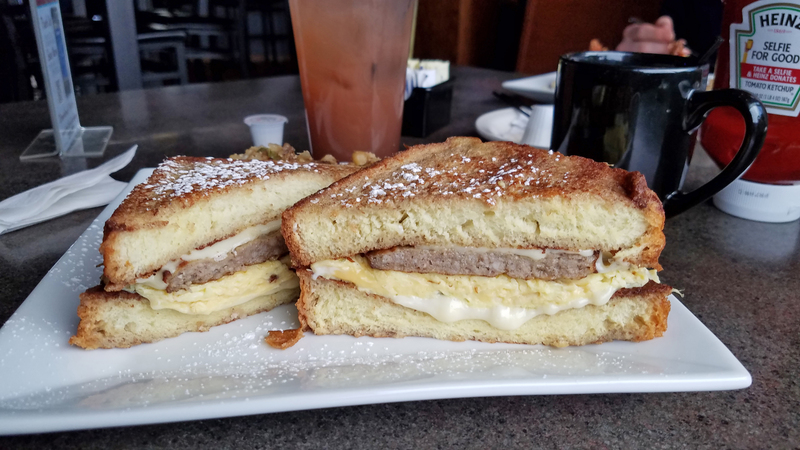 Prepare to stretch your mouth open to fit scrambled eggs, cooper cheese, and sausage, between Texas French toast. Let’s be clear– it’s delicious. Let’s also be clear– you’ll feel like a fat pig when you’re done eating it. Avoid the side potatoes, and fully utilize the maple syrup dip, and you may be able to conquer this monstrosity of flavor and breakfast joy. It’s one hell of a way to start the day!